UPCOMING LIVE TELESEMINAR – a special pre-summer ‘one-off’. Registration: Please register online and we’ll send you call information via email. Nature has already shown us the way to solve many human problems, from deciphering simple engineering puzzles to unlocking the mysteries of flight. In The Nature of Business, Giles Hutchins makes a compelling case for applying the same principles of biomimicry to the development of a new business paradigm. He demonstrates clearly how behaviours and organizations found in nature can be applied to help our organizations flourish in chaotic and uncertain times. He presents the challenges to the prevailing “business as usual” model, explains the pressing need for transformational change, and reveals the concepts and mind-sets necessary to inspire the businesses of tomorrow. About Giles Hutchins, M.Sc., MRICS, FRSA Giles fuses a business background with a love of nature by building a bridge between the two to help organizations transform towards sustainable businesses. He is a business change agent with over 15 years of business and IT transformation experience with KPMG and Atos International. His passion is exploring ways of applying nature’s inspiration to sustainable business transformation. 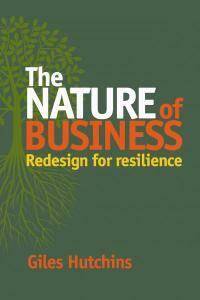 His work draws on a range of theories and practices (such as biomimicry, cradle-to-cradle & industrial ecology) applying them to the challenges businesses face today, providing practical insight and guidance to help businesses redesign for resilience in these volatile times. As well as engaging with a multitude of for-profit businesses, he engages with a number of leading non-profit organisations such as the Royal Botanic Gardens Kew, Earthwatch, Schumacher College, The World Wild Fund for Nature and regularly presents at leading business schools, universities, global conferences and blogs for a number of leading sites including The Guardian Sustainable Business.